It’s the first Monday of the month and that means another episode of Stylish Mondays. 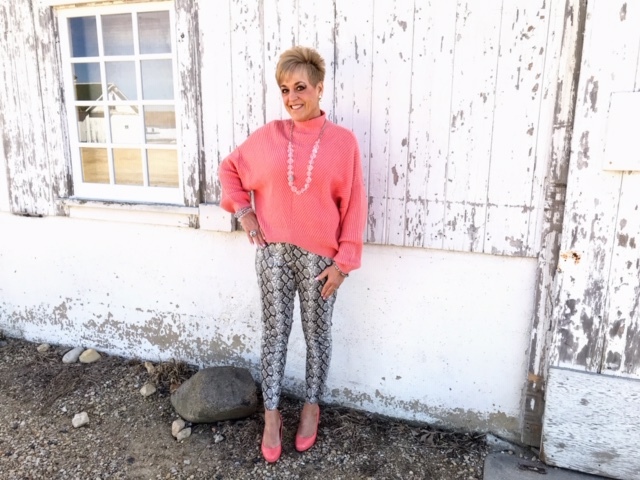 This month’s theme is: How we wear spring! 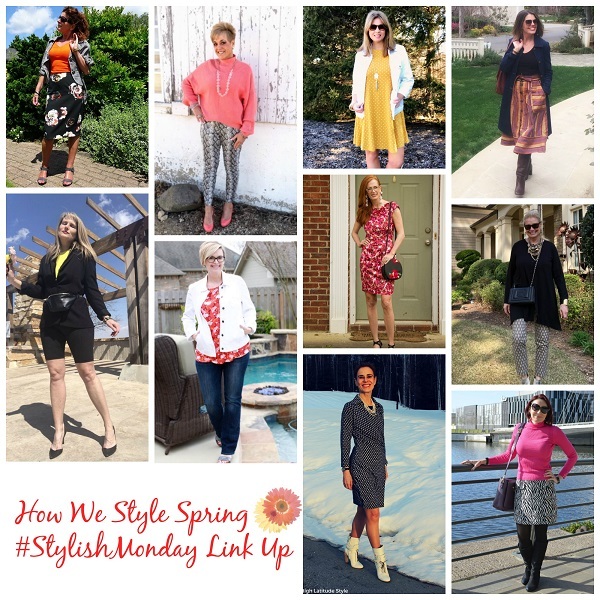 Stylish Monday is created out of a Facebook group of Life and Style bloggers. Every month we interpret a theme in our own way, fashionable wise of course. It’s a fun way to be creative with clothing and accessories. And to see how other women interpret a theme chosen by someone else. It is a fabulous fashionable way to create something beautiful with other bloggers. This month, the month that spring finally starts, the theme is very versatile. 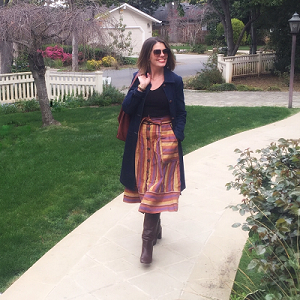 Because we all have a different take on how spring should look like in our outfits! For me it says: floral! I think I wear floral prints the most in spring. When everything is in full blossom, you hear birds everywhere, the smell of the garden! Yes, it definitely says spring to me. Here are my favorite floral outfits. I love this dress so much, such beautiful colors. And bare legs and peep toes, that screams spring to me! Also dark floral prints are fabulous, especially when combined with a bright orange top! Another dark floral but with a soft pink short cardigan. And espadrilles, the most fantastic spring and summer shoes! And now take a look at my fashionable blogger friends and visit their blog to see more! I hope you enjoyed this month’s theme: How we wear spring. And we hope to see you next month again! 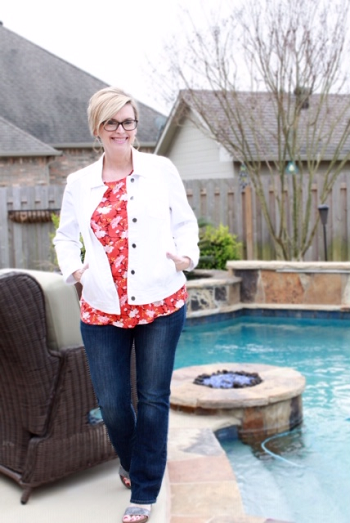 Now it’s time to show us your look, so linkup and have fun meeting other bloggers! Love love all your floral spring looks! As always, you put a fun twist on everything you style. Great looks! Thank you very much Suzanne! You do nothing less! 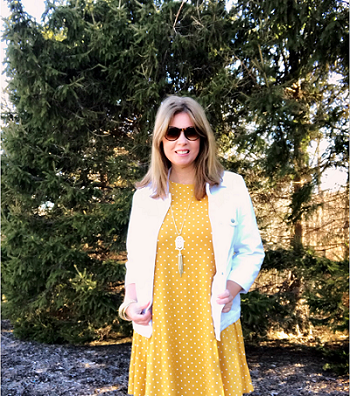 Beautiful Spring outfits! 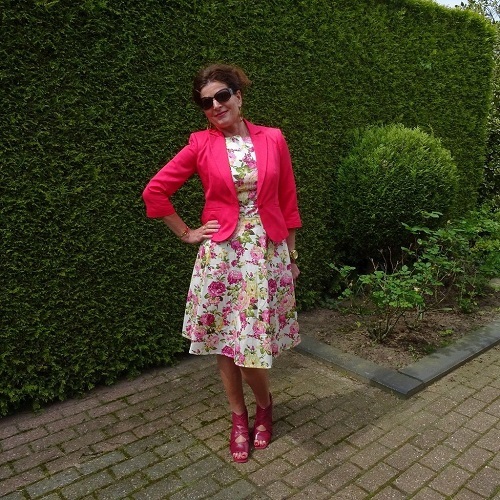 The floral print dress with pink shoes and jacket is absolutely gorgeous! Thank you very much Emma! I can see you like pink! 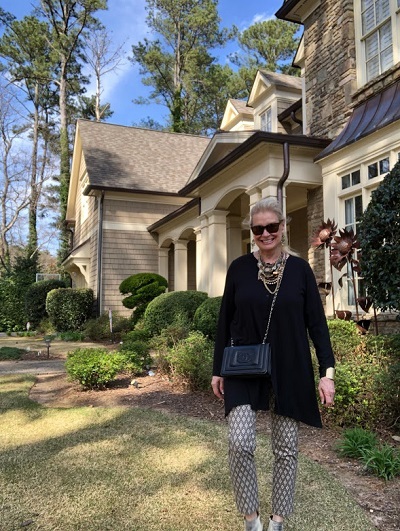 Love all these Spring looks Nancy! Now if only our weather here would actually warm up. Lol! Have a terrific week! Yes, same here! Haha, we are ready for it! I am loving your florals and bright colors! So glad spring is here! I wore espadrilles before they were in style but now I don’t own a pair! Might wait till I go to France! I do love florals, and they are so perfect for the season!! SO chic! All of you look amazing! Thanks Ann, maybe you know the brand, LillyBob. I love your florals Nancy! The print and colors on the first dress oh lala! I love it on you! Thank you very much Jess! Love all your floral options! Always great to see how each of us puts our own fabulous spin on the month’s theme! Another great collaboration! That first dress just screams spring with the pretty floral print and bright colors! Looks great on you Nancy! Ah, don’t you all look fabulous!? Loving all these interpretations of spring! Nancy, you look amazing in orange – I meant to mention it in your suit post but forgot. Ah, thanks Sheila that is very kind of you! You look beautiful in floral print! I have a few floral print kimonos that are frequently worn in spring, it’s such a perfect print for the season! Yes I saw it yesterday on your blog! Have a good week Mica!